The OliNet is very fast and easy to operate. When positioning OliNet, it is reversed into the trunk of the tree. Rubber padded guides provide easy alignment. 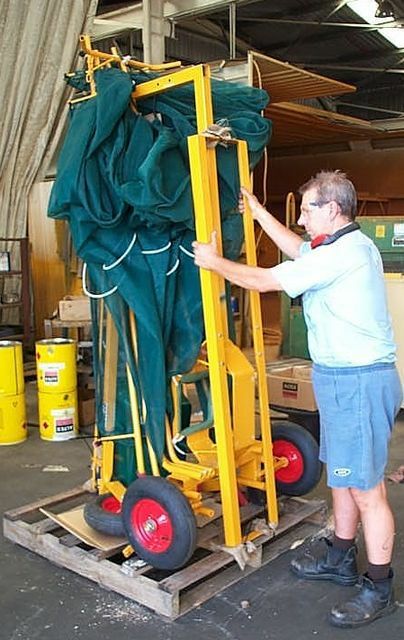 Arms with rubber padding are then swung around and held in place with the assistance of gas struts. Arms are then locked into position, automatically sealing the trunk with an over-lapping elastic join to prevent any loss of fruit. The tree is then ready for harvesting. As fruit falls into the net it is funnelled towards the centre and into 42 litre tubs (three supplied). 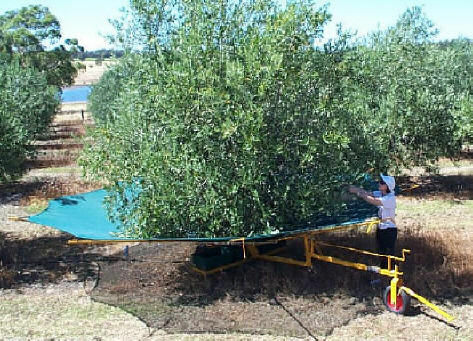 When harvesting is completed the arms are unlocked and swung back to allow the OliNet to be moved to the next tree. Tubs full of fruit can be emptied before moving to a new tree, or changed during harvesting. Sides are held in place automatically open or closed with the assistance of gas struts. OliNets are measured at the shortest distance (diamter) across the net, the longest distance for each size would be .5m bigger. Arms can be simply changed to fit either size net. The advantage of this is that the same OliNet frame can be used and extended as trees grow. A 4m OliNet has a similar frame but without telescopic arms. Arm extensions can be fitted to upgrade at a later date. 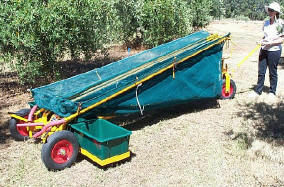 Or alternately a 5.5m OliNet with its arms retracted and fitted fit a 4m net may be ideal for a young grove. OliNet has excellent visibility when positioning against the trunk and is easy to manoeuvre in this compact form. In this compact form the elastic ropes are not stretched. The OliNet is easy to transport throughout the grove and is fitted with 16" x 6" wide 8 ply tyres with greased bearings. OliNet can be lifted by two people and put into a tray top utility without any disassembly. For long distance transport, The OliNet can be made even more compact by - easily retracting telescopic arms, un bolting tub rack & third wheel assembly. When stood on end it only takes up 1 pallet space! Automatically sealing the trunk with an over-lapping elastic join to prevent any loss of fruit when the arms are locked into position. Rubber padded on the guides & arms base provide easy alignment & protection of the trunk. This 16" steering wheel with auto park brake and fast height adjustment is standard. This wheel can be removed if mounting to a 4 wheel ATV, but still keeping the height adjustment. The ATV front drawbar now comes standard with all OliNets.